Linda Reichert is stepping down after leading Network for New Music for three and a half decades. She has played musical midwife to dozens of new works in the last three and a half decades. And now it's her turn to listen to music written for her. Network for New Music artistic director Linda Reichert is stepping down after this season, and for the occasion Network has commissioned nine works to be premiered next Sunday. Many of the new pieces promise to convey something about Reichert, who co-founded in 1984 what has been one of the city's most reliably energetic producers of new music. Linda Reichert works with Len Rieser at the Germantown branch of the Settlement Music School to prepare for a recital. Pulitzer Prize-winning composer Melinda Wagner set out to write something fun and celebratory — "a piece that would reflect not only Linda's abiding energy, but also her artistry as a pianist," said Wagner. And so Linda! Linda! is "skittery, rhythmic, a bit jazzy, and it includes a few wink-wink nod to pieces Linda surely knows." Temple University composer Maurice Wright wrote something contrapuntal, "as Linda brought many different voices together. It is whimsical at times, with sounds like laughter, and punctuated with expanding, striving motives," he said in notes to the score. With Acrobats, Augusta Read Thomas, a professor at the University of Chicago, aimed to capture "the spirit of Linda's magnificence, twinkle, positive energy, and her skill at the many 'gymnastic feats' she has performed for all of us and for music at large." Along with her composing, performing, and administrative colleagues at Network, Reichert has built the Philadelphia group into a nationally recognized commissioning and performing new-music stalwart. A notable number of works began life at Network and rippled out widely. Jennifer Higdon's wissahickon poeTrees has been performed hundreds of times. Passion Prayers by Thomas has been heard dozens of times, as have other works. In its time, the group has performed more than 500 premieres, having commissioned 144 of those itself. All that activity has made the tiny group — with just three employees and an annual budget in the low six figures — something of an ambassador for the city. Linda Reichert has brought “curiosity and energy” to the Network for New Music, says Pulitzer Prize-winning composer John Harbison. MIT professor John Harbison (another Pulitzer winner, as are half the composers on this program), who has written Nocturne for solo piano for next Sunday's concert, says that Reichert has given the city a "first-class forum for Philadelphia-area composers to present their music," and that he himself has benefited from her "curiosity and energy, in terms of a greater awareness of the city's musical abundance." Philadelphian Andrea Clearfield gives the idea of music rippling out a concrete form in a work inspired by Rainer Maria Rilke's poem I Live My Life in Widening Circles. Her piece, with a working title of Widening Circles, uses the Renaissance technique called soggetto cavato, in which the vowels of a word are "carved out" and assigned to their respective solfège syllables. In Linda Reichert's name, the syllables are I-A-E-I-E — or ti (mi), la (fa), re, etc. "The theme pervades the work in variation," says Clearfield. "Musical motifs expand outward as a tribute to Linda's [and Network's] wide-reaching mission to commission, perform, educate, mentor, and support contemporary music, which has positively impacted and will continue to influence the music world in Philadelphia and beyond," she says. 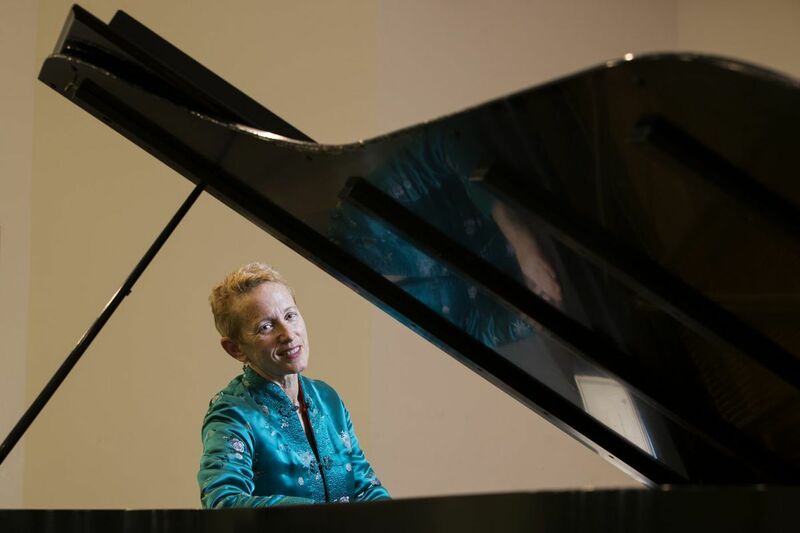 Like other composers on the program, Clearfield's connection has a more personal element: "The first commission in 2008 took me to the Tibetan plateau with artist Maureen Drdak in a season which paired composers and visual artists. The experience changed my life and work." Reichert will hand over the keys in June to Thomas Schuttenhelm, a guitarist and composer from Connecticut. She says she's been so busy with the season and the transition that it really only hit her 10 days or so ago that her tenure really was coming to an end. Driving home from one of her last concerts with the group, she burst into tears. "As much as I am going to miss the artistic side of things, I am going to miss the human relationships element even more — the regular contact with fine musicians and composers, playing with the Network Ensemble, the camaraderie during rehearsals and concerts, and so on," she said. "The Network musicians [and most of the composers] whom I have had the great privilege of getting to know over the years have profoundly affected my growth as a human being, with their qualities of integrity, commitment to an ideal, intelligence, and good-humored dedication to excellence and to Network. What am I going to do without these valuable relationships in my life? Create new ones, of course, but the loss is poignant." But before loss, creation. Reichert has a specific history with all nine specially commissioned composers, and some of that history is now memorialized in these scores. Richard Wernick says his Toccatina for Linda is intended as a mini-portrait of Reichert, "whose qualities include brightness, wit, irony, charm, and imagination." Next Sunday’s program honors Linda Reichert with nine new compositions, many by Pulitzer Prize-winning fans of hers. James Primosch, a University of Pennsylvania professor, aimed not to mirror Reichert in sound in Two Sketches for five instruments, but to create a work that moves through mood realms mysterious, playful, lyrical, peaceful and, finally, reflective. Bernard Rands, too, says he is not aware of "any specific attribute of Linda's that is expressed in my piano Impromptu No. 4. Such correlations are not part of my musical aesthetic in general," says the Philadelphia Orchestra's former composer-in-residence. But, he said, "I made the short piano piece as a loving gift to Linda in appreciation of her generous spirit — and to any other listener who willingly listens to and engages with the music." Jennifer Higdon says writing her solo-piano piece Notes of Gratitude for Reichert carried her through mixed emotions, from "gratitude for all that she has done for new music, the community, and the composers that have been premiered and performed by Network for New Music" to sadness at seeing her go, and to a sense of "celebration of all the good that Linda has created." When Reichert told the Network board of her wish to retire, members paused before deciding the group should go on. One of Reichert's last acts comes on the last piece of the program, which has been largely planned, uncharacteristically, without her input. She will play the Harbison piece herself. The good news is that Network will go on, with its work continuing to sound in the air — to borrow from the last line of Rilke's poem — as an "unfinished song."